When we first began the design process for this D.C. master bedroom, our clients thought they wanted a predominantly neutral space, but after spying the indigo and white patterned fabric in our samples bag (ironically it was pulled for another client! ), they fell in love and we quickly changed directions. Custom designed grasscloth wrapped nightstands provide attractive storage, and we were sure to sneak in some of our client’s favorite color—green—in the form of custom sconce shades, bedding, and a vintage Turkish rug. 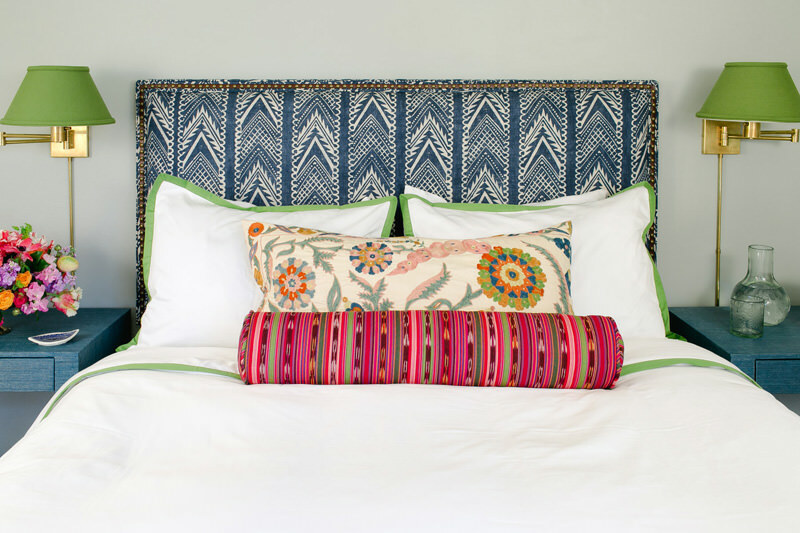 An intricately embroidered lumbar pillow and bolster in a Guatemalan stripe contribute to this energetic space.